'Maha Shivaraathri' � A Night of Celebration with the Divine! 'Maha-Shivaraathri' is the celebration, which is the 'Great Night of Lord Shiva'! 'Shivaraathri' falls on the 14th night after the new moon, but the one in the month of Kumbham or Maagha-Phaalguna in the Hindu calendar, which falls in February-March, as per the Gregorian calendar, is celebrated as 'Maha Shivaraathri' which is generally worshipped as the convergence of Shiva and Shakthi! Apparently, Parvathi (Shakti) asked Shiva to tell her which was His favourite day and Shiva told her that the '14th day after the new moon, with the darkest night' was his chosen day! According to another story, there was a clash between Brahma and Vishnu, as to who has the supremacy and as they were arguing, a huge endless pillar of light, the jyotirlinga appeared piercing the three worlds and as per a heavenly voice, Vishnu and Brahma split their ways to downwards and upwards respectively to find the end of the light in either directions � Shiva wanted to show them that they are equals! As Brhama was searching for the top end of the pillar, a 'Thaazhampoo' petal (Immortalised by the song, 'Thaazhampoo manamulla...'(Kaitha or Screw pine: Pandanus fascicularis), fell on him and he colluded with the 'Thaazhampoo' to lie to Shiva that he found the end, while Vishnu conceded his defeat. Shiva then appeared as a second pillar of light and cursed the 'Kaithappoo' that it will never be used to worship him and then cursed Brahma too, that he would have no place in ceremonies and pinched out one of Brahma's heads! Shiva then blessed Vishnu that he would be worshipped till the end of eternity � sending out a lesson to all that anyone lying deserves punishment, even if it is Brahma, the god of creation! There are around 12 holy jyothirlinga shrines, places where Shiva appeared as a fiery column of light, Somnath temple in Gujarat being the first!. This believed to have happened on the '14th day after the new moon, with the darkest night', in the month of Kumbham or Maagha-Phaalguna in the Hindu calendar � there are different versions of the same story! It is also believed that on this day Lord Shiva performed his most powerful dance, the 'Shiva Thaandava', the 'Dance of Creation, Preservation and Destruction'! Some believe that this is the day when Lord Shiva came to earth in the form of the 'Linga' � there are many versions of how the 'Linga worship' started � one of them states that after Shiva's 'Samhaara Thaandava', the 'Devas' started worshipping Shiva's 'Linga' as a way of calming Him, following which the 'Linga-pooja' came into practice; there is also another version involving the Sages in the 'Daaru Forest! Whichever story one likes to believe, there is one thing that is indisputable, the fact that Lord Shiva is the powerful One and 'Maha Shivaraathri' is the Great Night of Lord Shiva! 'Shivapriya' is the favourite tree of Shiva and Parvathi and its beautiful flower has an uncanny resemblance to the Shivalinga! 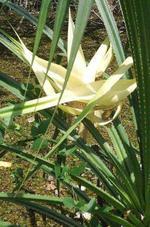 The flower petals resemble the hood of a Naga and therefore the name 'Nagalinga or Shivalinga'! Shivapriya: the botanical name is Couroupita guianensis, and is a member of the Brazil nut family. It's a native of South America and been in India for around 3000 years and is in cultivation at the Fairchild Botanical Garden in Florida. It's called 'Cannon ball tree' because of the size and shape of the fruit and the sound it produces when it falls to the ground, due to its weight, rather dangerous to anyone standing underneath -- it's also called 'Ayahuma or the Head of Spirit', in South America as it's believed to provide protection against evil spirit! The most beautiful flowers have a delicate fragrance, and have both fertile and sterile pollen; but the fruit when it breaks open as it falls to the ground has a foul smell, which attracts the animals. 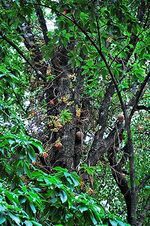 THe tree is almost extinct in India, except around the Shiva Temples -- but there is a Cannon Ball Tree on the grounds of SDV High School in Alleppey and I hope they would take good care of it! The devotees fast during the day and night, holding vigil, performing rituals and chanting the Panchaakshara Manthram, 'Om Namah Shivaya'. The night is divided into four 'Yama' and at each 'Yama', special 'Abhisheka / sacred rituals are performed. The vigil held through the day and night is believed to give immunity to the believers from all sins, and bring a good husband for the unmarried woman and for the married ones, betterment of their husbands and the whole family! It is also believed that by offering oblations of rice balls (Bali tharppanam) for the dear departed ones on this day would bring salvation and solace for the spirits of the deceased, and thousands of believers perform this ritual on the banks of the Holy rivers on this day! One must remember that keeping vigil through the night, chanting, 'Om Namah Shivaya' or 'Shiva Shambho' is not enough, as it is also a time for self-assessments, to have pure thoughts always, a decision to improve one's own life and to help fellow beings in need, which must include protecting women and children and the elderly in our society! We must also make a conscious decision to be aware of our civic duties and to obey the rules of the country, rather than crucifying the ones who are trying to implement them! The righteousness of Shiva and his Yogic Virtues should be looked on as a ' Focus' in life, drawing energy from the 'Shivam' to achieve greater things in our lives.